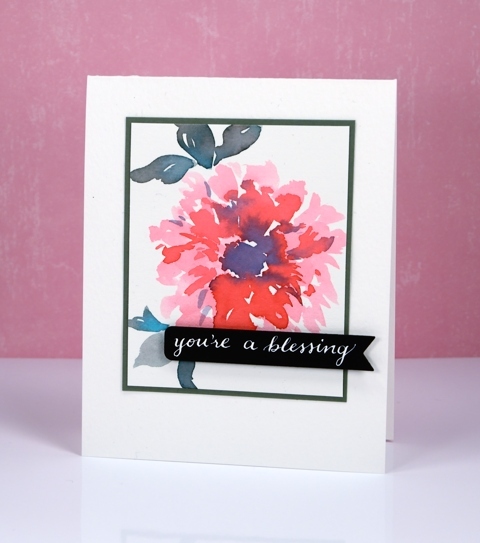 Today’s card features a hand painted flower and a hand lettered sentiment. I am open to suggestions as to what type of flower it is; it looks like it could be a dahlia, or perhaps a peony or pink cornflower. I am also a bit hazy on what I used to paint it – sorry – again! 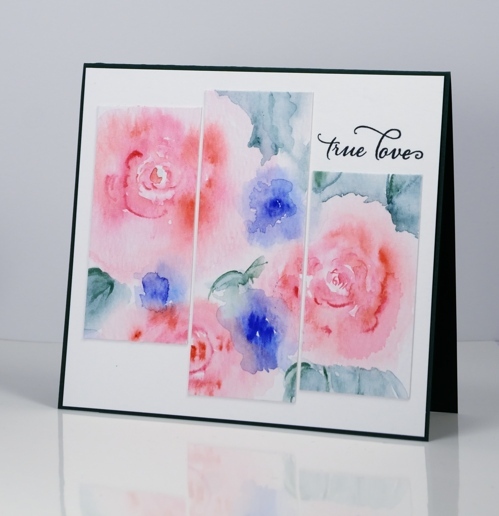 It was just a painting exercise that turned out looking like a real flower so I decided to turn it into a card. It could be distress stain or peerless watercolours. 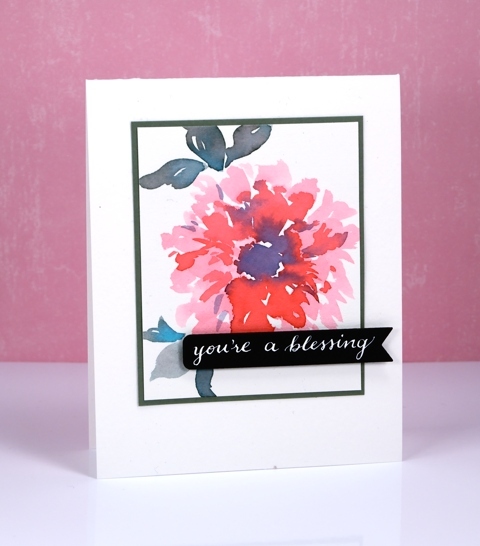 I matted the flower panel in a teal to match the leaves then popped a handlettered sentiment on a die cut tag. Hope you are having a delightful day. By the way The Foiled Fox is having a St Patrick’s Day sale this weekend, go check it out. Foiled Fox kindly sent me the Peerless watercolours that may or may not have been used on this card. They also sent me the beautiful nib holder that definitely was used to write that sentiment. In keeping with my resolve to mix up my card layouts a wee bit I have a triptych inspired card to share. 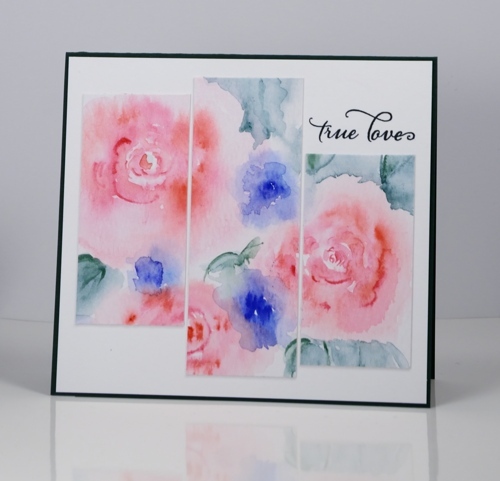 I painted the roses on a piece of watercolour paper, added leaves and blue flowers (not sure what they might be) then decided to find some inspiration on my ‘sketchy’ pinterest board. I sliced my panel into three strips of the same width then trimmed the ends so each would be a different length. The sentiment fitted quite nicely in one of the white spaces. I stamped the sentiment once in green then over the top in blue which gave me the bluey-green I was after to match my paint. I think the colours are soft enough to join in with the ‘pastels’ challenge on Less is More this week.